In honor of National Bullying Prevention Month this October, a group of incredible celebs came together stand with Lizzie Velasquez and her campaign against bullying. 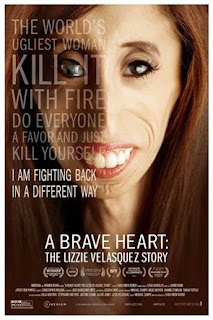 Lizzie, who has a rare syndrome that prevents her from gaining weight, started her fight against bullying after a cyberbully posted a YouTube video of her labeled “The World’s Ugliest Woman.” Now a motivational speaker, activist, and subject of the documentary A Brave Heart: The Lizzie Velasquez Story, Lizzie is rallying to pass the first federal anti-bullying bill The Safe Schools Improvement Act. Supporters that joined the cause include Kylie Jenner, Chris Hemsworth, America Ferrera, Kristen Bell, Sara Bareilles, Michelle Phan, Octavia Spencer, Bryce Dallas Howard, Katie Couric, Tori Kelly, Kacey Musgraves, Derek Hough, Dr. Oz and Zachary Quinto, who pledge that they're "with Lizzie" in the mission to end bullying. A BRAVE HEART follows the inspiring journey of 26-year-old, 63-pound Lizzie from cyberbullying victim to anti-bullying activist. Born with a rare syndrome that prevents her from gaining weight, Elizabeth “Lizzie” Velasquez was first bullied as a child in school for looking different. As a teenager, she was bullied online when she discovered a YouTube video labeling her “The World’s Ugliest Woman.” The film chronicles unheard stories and details of Lizzie’s physical and emotional journey up to her multi-million viewed TEDxAustinWomen talk (#1 TEDWomen event of 2013) and follows her evolution as motivational speaker and activist as she lobbies Congress for the first federal anti-bullying bill: the Safe Schools Improvement Act (SSIA).